Pulling the curtains on new customers from today. But this doesn’t mean we’re gone for good. (And it doesn’t mean we’re skiving off on our Christmas hollies early, either). “So what?’, you may ask. And that’s a very good question – however, I wanted to write this short post about why we’ve done this in the hope that other businesses may consider some of the issues this highlights. 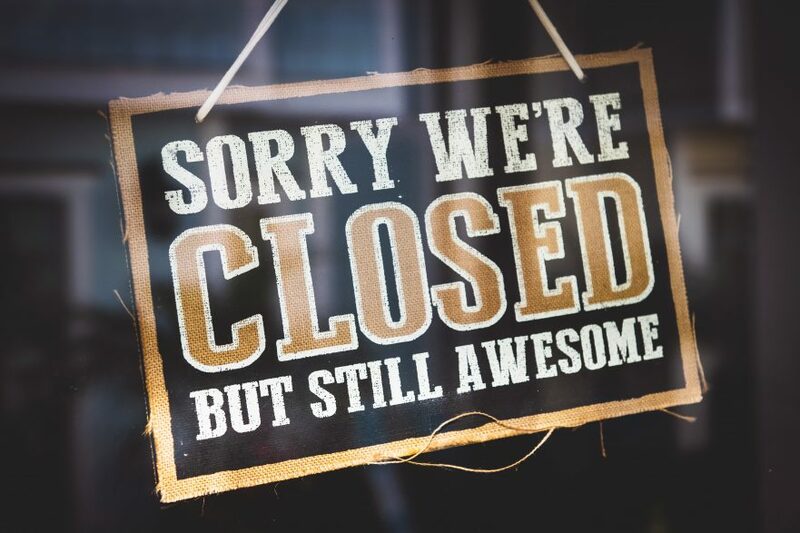 Well, we’ve taken the decision to close our doors in December to new clients. That sounds a little like business suicide considering what the festive period and New Year often brings, but there’s a method to our madness. Now that’s a pretty compelling reason. We’re at capacity. Our little team literally cannot squeeze any more juice out of our creative writing and marketing abilities before we break up for the Christmas period. By closing the doors now, it allows us to put all our attention on our existing clients during this shorter, more intense period. One of our big projects this year is improving our whole customer journey. Our work has so many moving parts and our clients have so many different needs, it takes some serious investment in time and effort to improve our customer journey from the moment someone sees one of our ads or blog posts through to delighting them as a client so they refer us to everyone they know. Although this is a constant focus, we’re creating something pretty damn spectacular for our clients right now and we want it to be aces. We have a pretty distinct style that clients and prospects constantly (and very kindly) comment on. Yet, it’s time for a change. We need a bit of time to tear everything down and build it back up again, even better than last time. The last thing I want is my fabulous little team heading into the Christmas break feeling destroyed from being put through the wringer before everyone finishes for the year. Yes, yes, I know and I’m well aware we’re not construction workers grinding out real work outside in this horrible weather and being a writer/marketer in a warm office with as much coffee as you need to hand is pretty cushy in the scheme of things. (Seriously, my hands could be used in a Fairy Liquid commercial they’re so delicate). But if you’ve ever done anything that’s required a smidgen of creativity you know how quickly that can dry up under pressure and make your work frustrating and below-par for your client. We’re not sitting and putting our feet up by any means, we’re just not creating a Christmas boiler room designed to kill everyone before they get over the line. So what happens if someone wants to become a Hello Genius client? Well, we’re operating a waitlist which will open again sometime in 2019. This way we make sure we have greater control over who we’re working with as an agency and the potential client is clear on what they get when they work with us. Seriously, some people love us… and some really, really don’t. It’s best for everyone to work out those little kinks early on and if someone would prefer to work with a more traditional agency, we’ll gladly direct them to a company who is a better fit. I hope this provides some insight into our thinking and may offer some ideas on how to give time and space to your team to make your business even better. If you would like to work with us in the future and think we’d be a good fit, please join the waitlist right here and be notified when we’re open again for new clients.